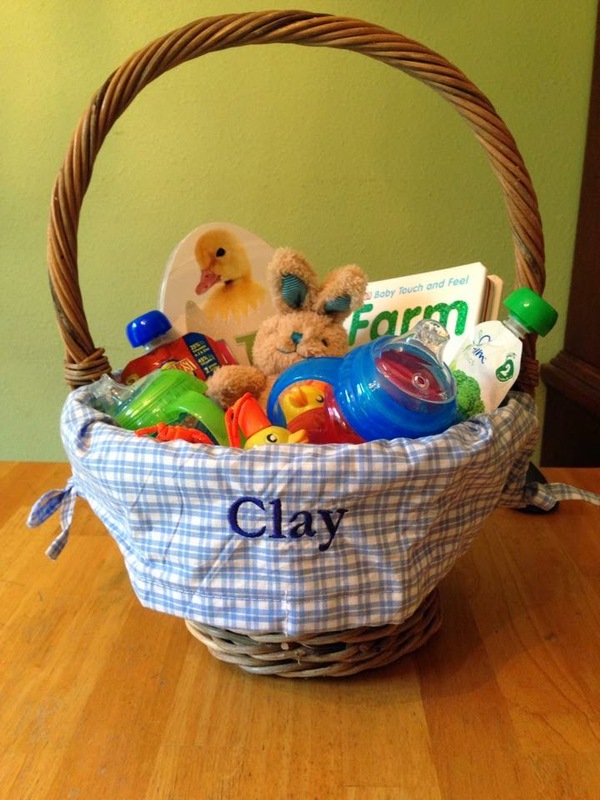 A Journal for Clay: Clay's First Easter! We started the day by going to church. I had chosen to go the 8 O'clock service since Clay is usually down for his nap by 9:30. What I didn't realize was the 8am service was the church's Traditional service. Oops. I'm not a big fan of the traditional services, but Clay did well during church and Daddy did an excellent job of entertaining him. On to breakfast! We went to IHOP and enjoyed a really nice breakfast. Clay didn't want to eat anything, and spent the entire meal turned around in his high chair, flirting with all the people sitting behind him. He was so well-behaved, I actually kept forgetting he was even there and found myself participating in an adult conversation for once. Woo! Homeward bound! By now it was nearly 10:30 and I thought for sure that Clay would need a nap upon arriving at home. But, he didn't seem at all tired so I set out the little Easter Eggs which I had pre-filled with yogurt covered blueberries and bunny shaped graham crackers. 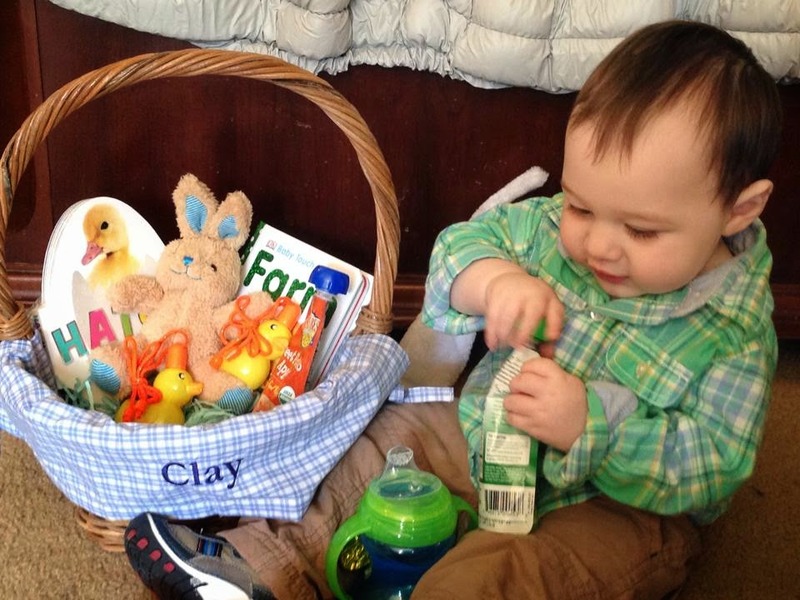 We all helped him "find" the eggs and helped him to open each each egg and eat a treat from inside. 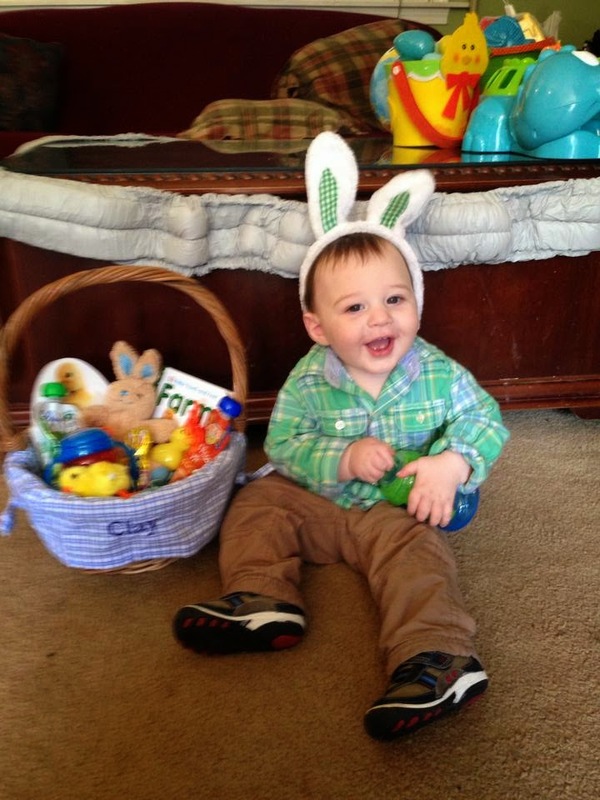 He seemed to really enjoy his egg hunt and definitely enjoyed the treats! Then, he got to dive into his basket! He was very interested in his sippy cups and LOVED the little wind-up chick. We played with that chick up until nap time. 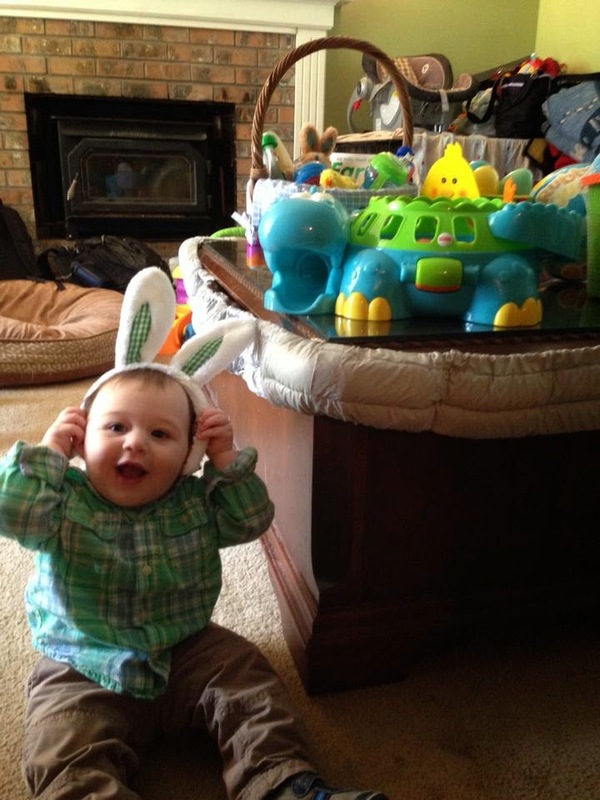 All in all, it was an excellent first Easter! This was so much better than Christmas for me, because Clay actually had to time to play with and enjoy all of his gifts this time.